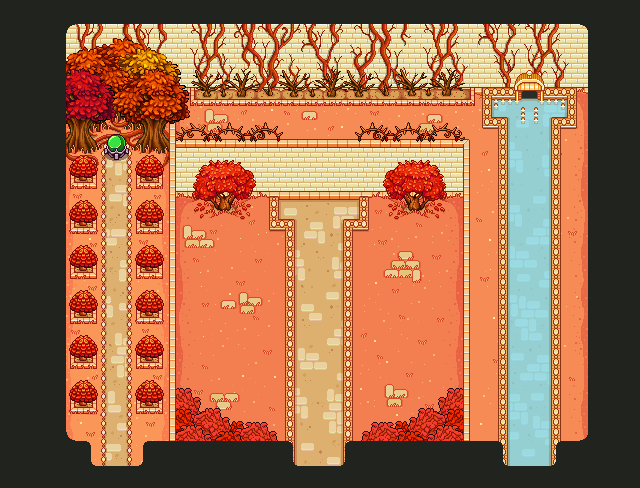 This week we’ve continued working on the Temple of Seasons. It will be one of the most graphically heavy areas of the game since both enemies and scenery will have three different variations, so our grahpic duo have wasted no time getting started! Below is one of the early rooms of the temple in all of its autumny glory. If you missed it a few weeks ago, Vilya have started up a workblog that goes a lot more indepth about the graphical assets she’s making, like the room seen above. Be sure to check it out! Fred have spent the week finishing up all of the animations for the Summer varation of the Knight enemies we showed off a while ago. The Summer Knight will work as a base for both the Fall and Winter versions. Besides different weapons, each enemy will have their own set of unique moves they will have access to if the area is set to their season. Above is the Summer Knights special move, a high damaging single target attack with Guard Crush (instantly destroys your shield if not perfect guarded) and a huge knockback. Besides fancy special attack, the knights will be the first enemy in the game that uses shields. The enemy shields will work similar to player shields in terms that they have their own HP and can break if taking too much damage. Weekly Recap #137: No Refunds! …or? First off, we’d like to remind everyone that the talent system is now live in the Frontline beta! So jump in there and test them out. Some systems have been slightly reworked or extended to facilitate some of the Talent effects, so the potential for amazing bugs is vast! 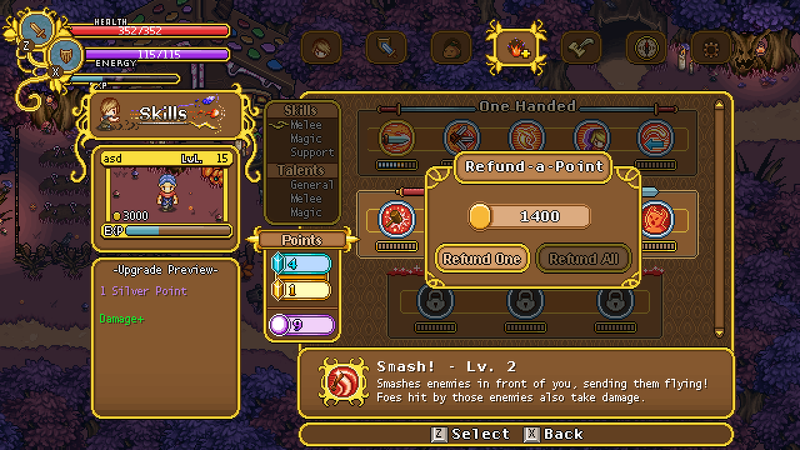 Upon loading an old character, all skill points will auto-refund and adapt to the new system. Another new addition in this update is the ability to refund skill points! This is something that has been suggested and discussed for a long time now, and it has never been an extremely prioritized topic (partly because of the /respec cheat already in game). With the advent of Talents, however, we decided to test this feature out. For a fair bit of gold, you can refund a skill point you might have misplaced or began to regret! The cost scales with level (currently 100 gold per level gained), so it should always be a cost that stings at least a bit. Oh, and something you might’ve noticed just from looking at the screenshot above: we’re removing a charge level from all active spells. There are three reasons behind this. For one, finding openings for charging up is hard as it is, and will only get harder as you gain more charge levels. Having three charge upgrades instead of four helps a bit in this regard. This is probably the smallest issue, even. Another reason is that having five different charges makes for a pretty awkward power curve. Preferably, the Silver, Gold and Ultimate charges would all need to be significant upgrades compared to their previous charge level. This meant the Gold charge would have to be “really cool but not too cool since we must add a fifth power level after it”. What we’ll do now is that you just skip that step, and will get the best version of the skill at level 10 (which will be acquired at character level 19 with the current system). Finally, we acknowledge that it would probably technically be possible to get the five step power curve to feel alright, but we always have to keep in mind the development time (including testing and balance revisions). We doubt very much that the previous Gold charge would have added a ton compared to “just” having four charge levels, but it would mean many hours of brain storming, animating, implementation and tuning. In case you missed it, we’ve now updated the Frontline beta to include the Toy Factory! If you decide to play it through, we’d love to hear your thoughts over at the forums, regardless if you liked it all or hated it all! When you try it out remember to not use overpowered characters (unless you want it to be easy)! Being level 15 or something is fine, but if you’re sporting the best gear in the game and a high level pet, you should probably equip something less powerful, or at least switch to Hard. With those news out of the way, let’s get our hands dirty with the upcoming Skills & Talents Overhaul! Talents will be a new kind of passive skills, which the player can level besides the regular active skills that are in the game today. You’ll level these using talent orbs, which you gain one of every time you level. The intended function of the Talents are to improve the possibility to specialize and help create build- and gameplay diversity, as well as give players opportunities to mitigate weaknesses. 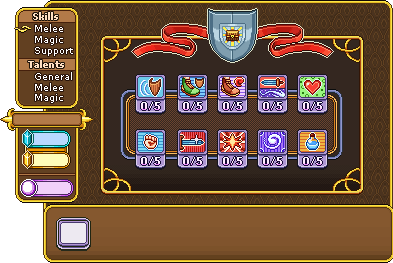 For example, there’s a Talent which extends the Perfect Guard window to help players struggling with that, and we’re also implementing Talents that promote using a combination of weapon skills and magic spells by adding bonus effects. Gameplay wise, the system should help players find a more personal play style, but it will also help improve other aspects of the game. Since most people prefer to switch between no more than 2-3 active skills, there will eventually be a point where additional skill points won’t feel as rewarding as they did early on in the game. With Talents, there will always be something useful to spend your points on, ensuring that each level up gives the player a meaningful choice. It also opens up for a new kind of quest reward. While we already have a quest which grant a Bronze skill point, due to the problems mentioned above, it isn’t necessarily a cause for celebration for those players who already got their main skills leveled to Silver. A Talent point will nearly always be valuable, making it an “objectively good” reward. It’s also much more interesting than giving just EXP. To help Talents stay relevant, all Talents will have percentage based effects. That way, regardless if you’re level 10 or level 100, that 10 % MaxHP bonus will be just as relevant. If you want to check out more details about the Talents we currently have planned, and come with suggestions for new ones, please check out the official forum thread! Weekly Recap #135: Winter is Coming! Fred is back in town, which means the animation machine is back up and running! We’re totally going to regret saying this, but we’ve got our aims set on updating the Frontline build before the end of the week. The update will include a prototype of the Toy Factory mini-dungeon, as well as the Winterland enemies. Since we’ve focused on implemented the story parts, the area is pretty barren when it comes to quests and other stuff to do — that will come later, possibly even as late as with/around the Season Temple! Lastly, Vilya is starting a work blog where she’ll post more stuff she’s making for the game and write about the production from her point of view. If you want to know more about how we work or simply enjoy following dev/artblogs, you should definitely head over there!